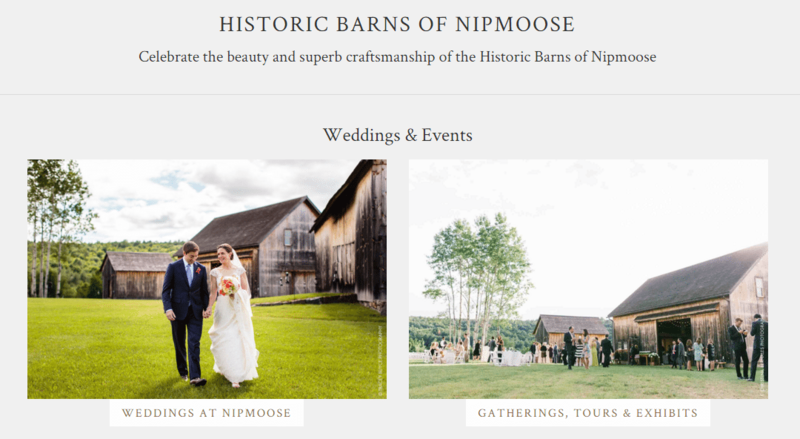 We recently had the good luck, good fortune and good fun of completely revamping the website of the Historic Barns of Nipmoose. Located in Upstate New York,the Historic Barns are a wonderful venue for weddings, gatherings, tours and other celebrations. The existing site was a bit dated. The central problem was that it was not mobile-friendly (responsive). In 2016 you simply must have a website that renders well on smartphones and tablets. We think this is particularly true if your visitor demographic tends to the younger side, which many married couples do. The Historic Barns have a compelling story to tell, and do a lot of the telling with beautiful imagery. We wanted to make sure that visitors to the website could easily navigate to their friends’ wedding pictures, as well as see just how beautiful the venue is. The site works in many respects as a tribute to those photographers who have taken so many stunning photos at Nipmoose. The venue is run by the nonprofit Persistence Foundation, and so we made sure to continue to include information about the history and founding of the venue. There are also links to the Nipmoose social media assets. We have made it very easy for visitors to share — via their own social networks– the terrific content on the website. We also made it very easy for visitors to contact Nipmoose — an essential element for any retail establishment with a physical presence. New for GoatCloud was the collaboration with the good people of CLP Design Studio and RBP Web Designs. GoatCloud largely oversaw the project, which was largely implemented by CLP and RVP. If you are thinking about getting married, think about getting married at the charming rustic barns at the Historic Barns of Nipmoose in Buskirk, New York! In the meantime check out their awesome new website at nipmoosebarns.org.